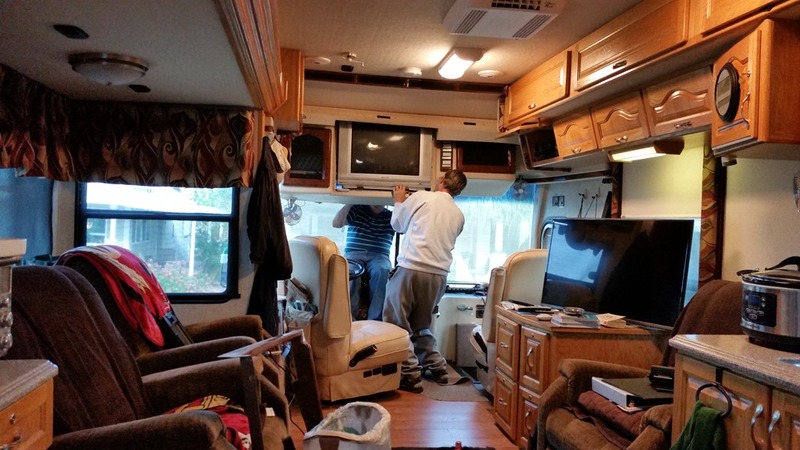 Saturday- Bob did some more wiring in the MH for the new TV. I went to water aerobics. Whew, a different CD to follow. This one wore me out! The knees are doing well though. 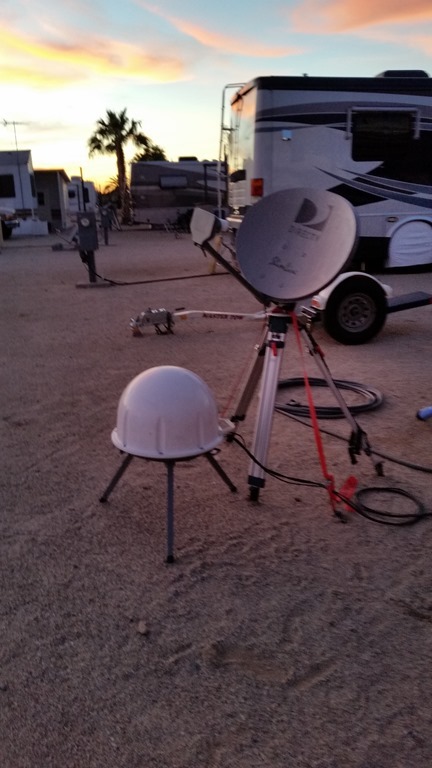 Bob’s wiring means that we can get satellite on the new TV, but still through our portable satellite, and it is not HD. When I arrived back from water aerobics, he was watching all the Star Wars trailers on YouTube. We re-arranged the MH. We moved my recliner across from the TV, next to Bob’s. We had two folding chairs behind the stationary chair in that spot, so we put them in the storage behind the recliners. We moved the stationary chair over next to the file cabinet. We are keeping the vacuum there, and moved the shredder over there. Then we realized that we cannot see the clock. So we have to work on that issue. Bob took it down, and put it on the kitchen counter so that we can see it there until we make a decision on where it is to go. We can get HULU, which we have for one month free, so we watched two free movies in the evening. We like the new TV a lot! Sunday- We did out usual financial stuff. We went to lunch and to JoAnnes, I am still using the 60% off coupon. We stopped for gas at Costco ($1.89/gal). We stopped at Walmart for groceries, and returned home. Bob messed with more wiring. When he got frustrated, we left and went to Baskin Robbins for a buy one, get one free ice cream. Bob had a coupon which was expiring today, on his phone. We returned and he solved his issue. 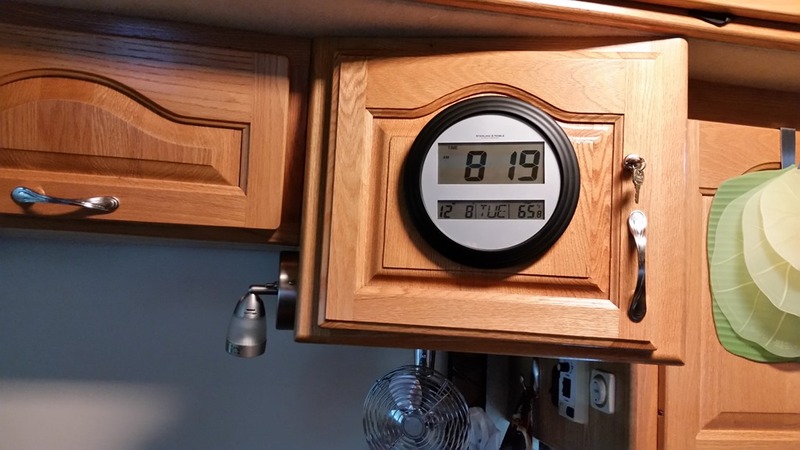 He put up the clock on the cabinet that had the little TV when we bought the MH. The MH had 4 TV’s when we bought it. We have gotten rid of two. We went for a walk. I have not been doing a lot of walking and I need to do more. So off we went. We stopped in a Mike and Linda’s, which the dogs love to do as they usually con a treat out of one or the other of them. We sat talking for a while, then returned home. We watched TV on the new TV. Monday- I went to water aerobics after starting the sheets washing. Bob took the towels over to the park laundry. We returned and I called Paul, ‘Da Builda’, who does our cabinet work. He is coming on Sunday to re-measure the bedroom door and to measure for the door to the area where the old TV currently is placed. We ate lunch, then read our books. We went to dinner with Mike and Linda at ‘Toms Thumb’. The restaurant had been on ‘Diners, Dives and Drive Ins’. It is very new, and is a gas station with a car wash and detailing in the back. It is “Cracker Barrellish” with a large store with lots of nice stuff including a nice wine selection. Then it is part 7-11 with drinks and chips etc. But the main part is the BBQ restaurant. It is very, very good! They serve breakfast, lunch and dinner. We ordered a three meat platter, which came with two sides. The meats were a beef brisket, pork BBQ, and chicken BBQ. They had 6 choices of BBQ sauces that you can add. We ordered the Mac and Cheese and sweet potato fries for our two sides. It was enough for both of us, for $16. They have nice tables and the Redskin/Cowboy game was playing on the TV. Definitely a place we will go back to! Of course, the company was also great! Tuesday- We were up early as the Direct TV installer is scheduled from 8-12. He arrived at about 8. He and Bob discussed our set up, then they went outside to the satellite and worked on the set up outside. Bob wanted to watch how he set it up for when we need to set ours up. I was planning to go to water aerobics, but it was cloudy and in the 40’s, and breezy. Brrr! I went to Mahjongg at 10, but only MaryAnne showed up. We sat and talked for awhile. I returned just as the Direct TV guy was leaving. He had given us a new satellite dish, portable, and had taken back one of the Genie Mini’s that Bob ordered. He put the Genie directly to the TV, saving us almost $7 per month. Every little bit we save, is money that can go towards travel. Here is our old and new satelitte. The little one is the old portable. We cleaned up the MH some, but Bob still had wires to cut and other tasks to do with all these changes. We ate lunch, then went to Costco. What a zoo, and it is not the weekend! We returned home, and sat outside for awhile, reading our books. The weather is warm, in the 70’s, but it is not going to last! We ate dinner at home and watched a movie on Hulu on the new TV. Wednesday- I was off to water aerobics again this morning. It was nice out and the hot tub is still hot, but there are still no jets working. Bob and Ray were taking out the old TV when I got back. They had to do a lot of work to get the wires unattached and the screws out. It took some maneuvering, and the old TV is very heavy. Bob continued to fiddle with the wiring up until it was time to leave to go to Scotsdale for lunch. We met up with friends Glenda and Bob Hamburg at Café Zupa at the mall. We had a nice lunch and spent almost four hours sitting talking about our travels. They have a 5th wheel and had traveled to Florida last winter. We left at a little after 4 to return home, Thank you Arizona for 2 person carpool lanes on the I-101. We moved into the carpool lane and flew back to Paradise. 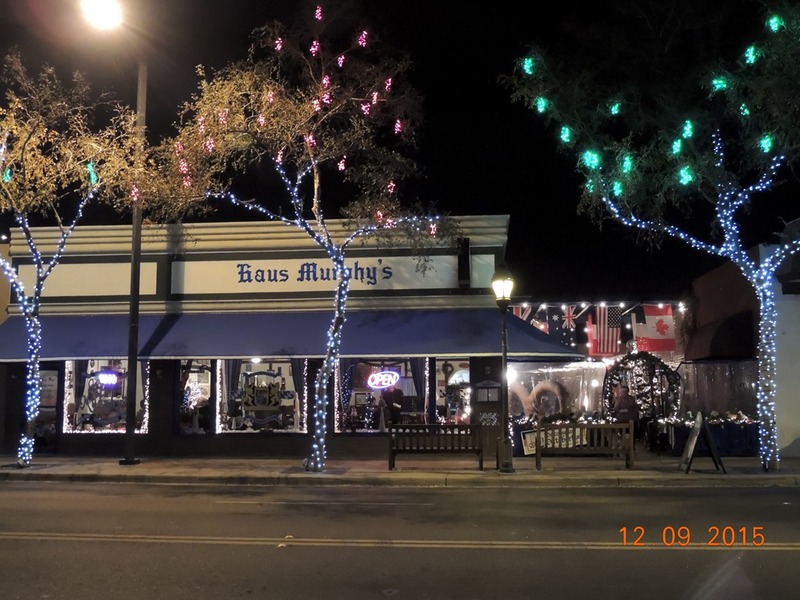 We walked the dogs and fed them, then we took off with Linda and Mike for Haus Murphy in Glendale. 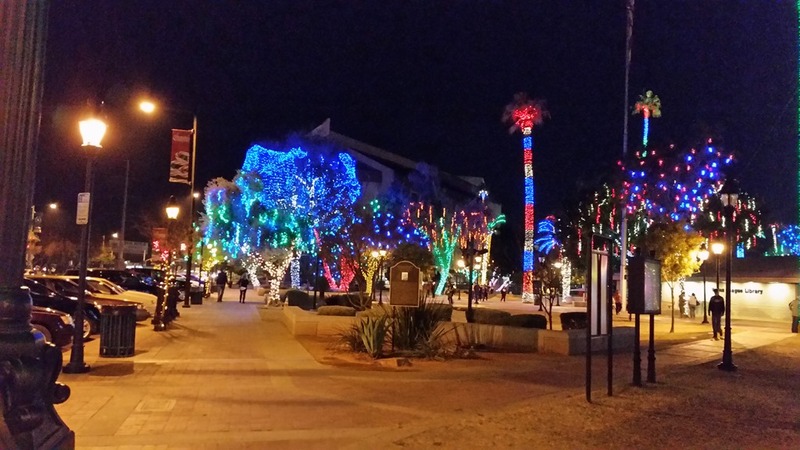 We ate dinner, then wandered around the Glendale Glitters, their Christmas light display. 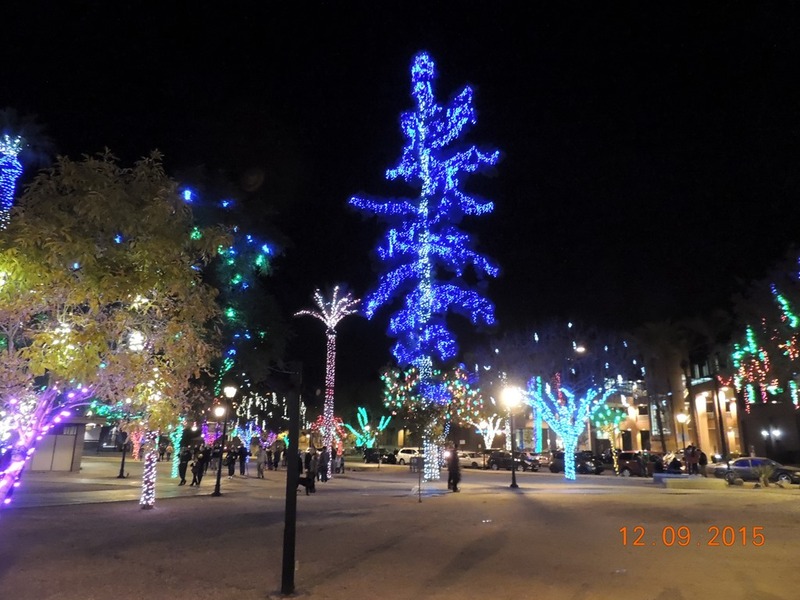 It was very pretty; the whole city of Glendale is lighted up. We were home by 8:30, watched some TV and went to bed. Thursday- I went to water aerobics in the morning while Bob continued to work on the wiring. 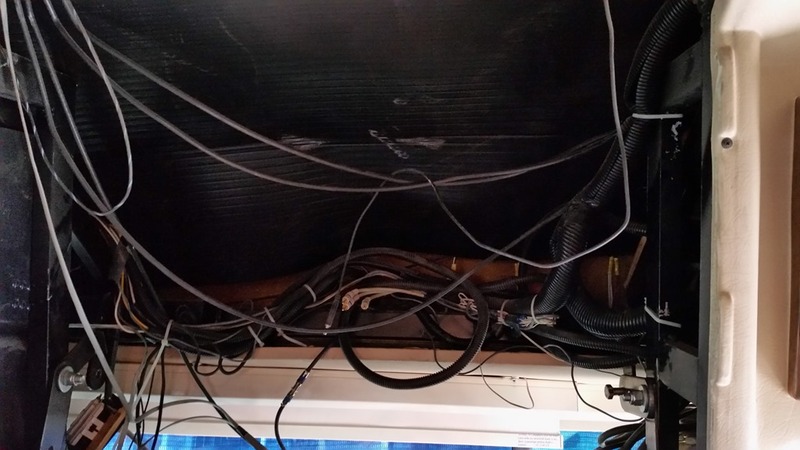 I had no idea how many wires that there were behind the old TV. Bob is trying to chase down where each wire goes. Then he needs to cut the unnecessary ones. We worked on tasks all day. We took the dogs for their walk. 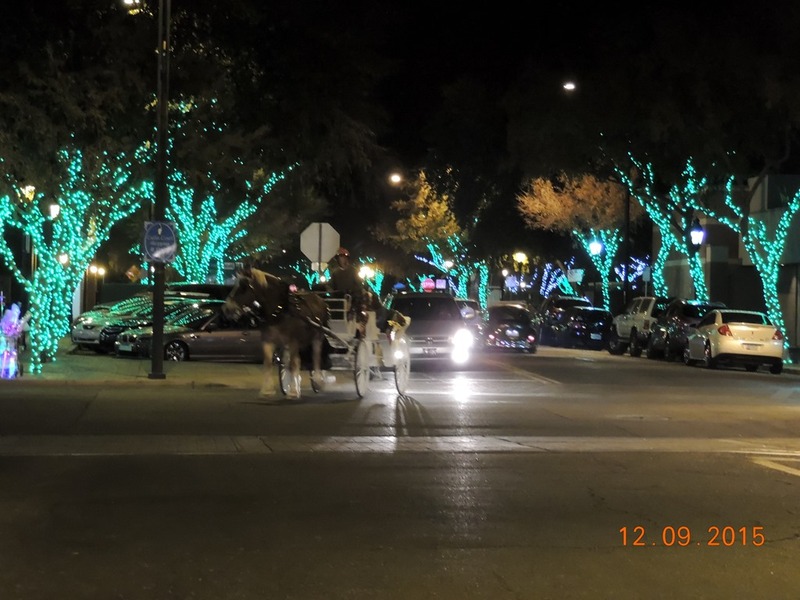 We rounded the corner onto 25th street ( we live on 21st street) and the street was in an uproar! First a Schnauzer raced towards us. She stopped and met with our dogs. The guy who lives on the corner, grabbed the dog and carried her back home. The woman who lives in the MH where the dog escaped from, had lost her four year old grandson. So the street was looking for him. They asked if we had seen him, but not in the direction that we came from. First place Bob looked was under the MH, which of course was where he was hiding! End of issue, so everyone could settle down! We continued on our way. We stop every day at Linda and Mikes. The dogs like to visit, as the usually get treats (one time a day only) and they can visit with Sable, their Pug who is always glad to see them. ( Could be because she also gets a treat!). We returned home, ate dinner, and watched TV. Friday- I went to the card group at 9AM, leaving Bob still working on the wiring. I returned at 11, put my stuff away and Bob started cussing. He had cut the wire to the antenna. So he had to fix that issue. We ate lunch, then took a nap. We had dinner, then were off to Square Dancing from 6:30 to 9:30. We were exhausted when we returned home. We are having a ball though, as we both enjoy the dancing so much. The patterns are coming back but we still do not feel ready to go to a dance yet. The callers call faster when they are doing a singing call. 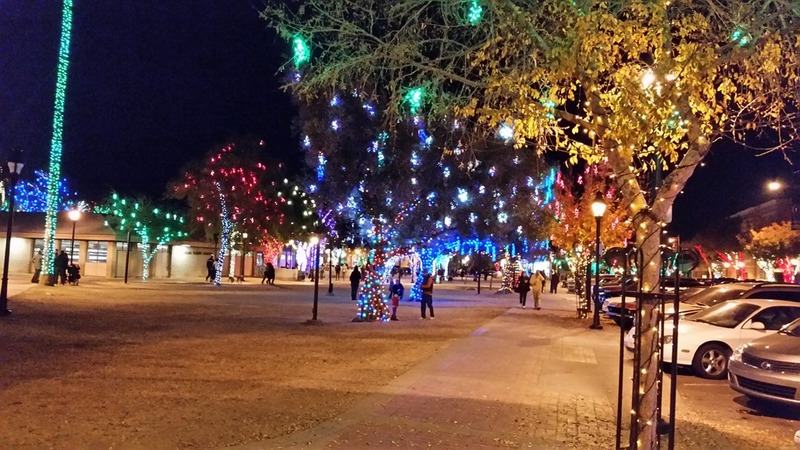 We hope to go in January or February.